Last week, the communications team hosted two instalments of Health Matters: Art in Recovery, a member’s event exploring the unique ways in which art can be applied as a route to recovery. The event featured presentations from staff members who have applied creative disciplines to physical and mental therapies in Oxfordshire. Each speaker then hosted twenty-minute workshops that gave attendees the opportunity to get a taste of how art can improve the patient experience. 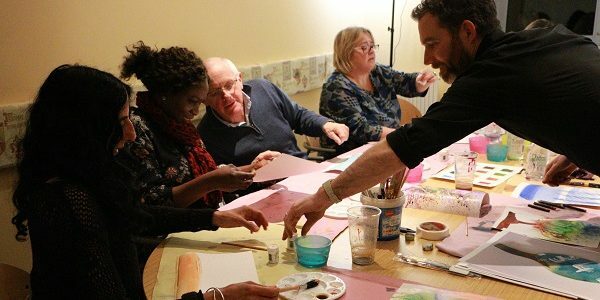 Erica Lamb, from the trust’s communications and engagement team, said: “This event was about giving members a chance to learn first-hand about some of the more creative ways that recovery can be approached both physically and mentally. Attendees heard from Angela Conlan and Paula Har of the Creating with Care programme at Witney Community Hospital; Tom Cox, Artscape project manager; and speech and language therapist Catherine Woolley, who spoke about a drama programme aimed at improving children’s social skills. They then had the opportunity to try seated dance and painting, as well as several dramatic exercises. The next Health Matters event is scheduled for late February. Stay tuned for more information.